In a large lidded skillet heat the oil over medium heat. Add coriander, cumin, curry, jalapeno pepper, garlic and stir for thirty seconds. 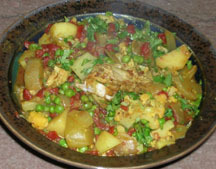 Add onion, yacon, and potatoes, stirring frequently until vegetables begin to soften, about 5 minutes. Add tomatoes, chicken and cauliflower. 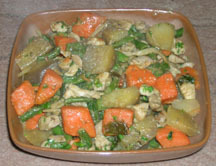 Bring to a simmer, turn heat to low and cook covered until vegetables are tender about 15 minutes. Stir in peas and cook, uncovered until the peas are tender about 3 minutes. Stir in cilantro and serve. Thai curries are fast and easy when you use a commercial curry paste. For this recipe I used Mae Ploy brand green curry paste. It comes in a 14 oz. plastic tub. Other ingredients like fresh basil and Kaffir lime leaves are optional but they do provide extra flavor and aroma. Yacon in this recipe is lightly cooked and it contributes a fresh crunchy texture and taste. If you have access to yacon and like Thai style curry, I urge you to include yacon in your favorite recipe and see how you like it. We served this with Brown Jasmine rice. Prepare and chop all ingredients before you begin cooking. Take a large lidded skillet and place it on medium high. Most coconut milk will have a heavy layer of cream that rises to the top. This is a good cooking oil, scoop out a spoonful and place in skillet. Add garlic and stir, as soon as you smell the garlic cooking, add yacon and sweet potato, cook for five minutes, stirring several times. Add chicken, coconut milk, curry paste, fish sauce, sugar and kaffir lime. Stir well. Turn heat down to medium low and cover. Cook gently for five minutes and add broth and green beans. Continue cooking for ten minutes. Stir in basil. If beans and sweet potato are tender and cooked remove from heat. Taste and add more curry paste if needed or more broth if sauce seems dry, stir in cilantro and serve. Total cooking time is 20-25 minutes. Peeled and cut yacon discolors when exposed to the air. Acidity from citrus or vinegar maintains the white color. When making this salad, prepare the dressing first so you can quickly add the julienned yacon to it and preserve the color. Note my suggestion for using the food processor to speed preparation. As I keep working with the yacon in recipes I find I’m mostly trying to adapt dishes that might use jicama, Asian pears, potatoes or daikon. Some have worked well enough to publish on this blog. 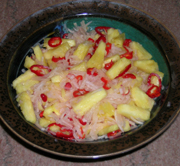 Combine ingredients in a bowl and stir until mixed. Set aside. Prepare dressing before making salad. To shred in a food processor peel both yacon and carrots and cut into 2” lengths. Place these in the processor and with a shredding or julienne blade firmly press on the vegetables while the processor is running. A bit of pressure produces a large shred that is almost as attractive as from a mandoline. Mandolines or the Japanese Benreiner version, produce perfect strips but I worry about carelessly cutting off part of my knuckle. * Wasabi paste or dried wasabi produce similar results in this dressing. This is the green tinged horseradish relative native to Japan. My friend Joyce and I have been sharing birthday dinners for nearly twenty years. This year, it was my turn to prepare dinner for six, so I seized upon this as an opportunity to prepare not one but two yacon based dishes for for our meal. This salad really shines with the yacon and apple combination. Waldorf salad was first served at the Waldorf Astoria hotel in New York in 1896. It was a very simple combination of mayonnaise, apples and celery and became instantly popular. 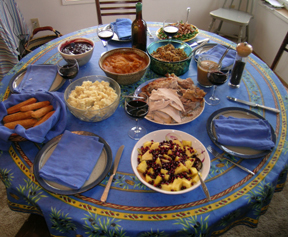 This recipe is adapted from one that appeared in Bon Appetit Magazine. Yacon is a delightful combination with the traditional apples. Served in a nest of radicchio or bibb lettuce it makes an attractive first course. Combine yacon and apples with lemon juice to prevent discoloration. Stir in mayonnaise, sour cream and blue cheese. Add celery, chopped radishes and cranberries. Radishes are quickly chopped in the food processor. If serving immediately add nuts and parsley. If not set aside in refrigerator and add just before serving. Serve in a dish or spoon into two nested lettuce or radicchio leaves. 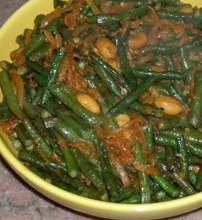 In this recipe the shredded yacon and green beans are highly seasoned. The Yacon absorbs the color and flavors of the sauce and assumes a new identity. Shrimp Paste with Bean Oil is a wonderful sauce recommended by our friend, Chef Eddie Chong. It’s similar to the expensive Chinese XO Sauce. Look for it in Asian Grocery stores. It contains shrimp, garlic, soy oil, salt, peppers, MSG, (I know) and paprika. Hope the coming photo of the 7 oz. jar makes your shopping easier. To prepare without this sauce add 2 tablespoons minced dried shrimp, an extra garlic clove, and ¼ teaspoon paprika. The garlic, peanuts, chilies and paprika give this dish a delicious punch and even the shrimp can be omitted with good results. Yard long asparagus beans were used in this photo, they are interchangeable with green beans. Select a large lidded non-stick skillet. Lightly heat skillet and add garlic, ginger, Serrano pepper, and cooking oil. Stir briefly until garlic becomes fragrant and then add beans. Stir for 2-3 minutes with temperature turned high. Beans will begin to wilt and show darkened spots. Add water and cover with lid, turn temperature to medium and cook for five minutes. Lift lid during this braising period to stir once or twice, adding another two tablespoons of water if it evaporates. Add yacon, shrimp paste, soy sauce, sugar and pepper. The yacon will give off liquid and you will need to stir with a spatula to combine and evenly cook ingredients until beans are tender. Stir in peanuts, adjust seasonings and serve. Depending on the meal this dish accompanies you may want this to be a little sweeter, more garlicky or hotter. Try this recipe as written or with the suggestions above and then fine-tune it to your own preference.